Our firm has extensive experience in both state and federal criminal defense, and including in cases where there is an overlap in both state and federal jurisdiction. We have handled very large fraud cases, including those involving millions of dollars. We are specialists in white collar criminal defense, including complex schemes involving real estate, securities, negotiable instruments, investments, sales programs, phone solicitations, banking, and money laundering, among others. Use of mails for theft or fraud is a federal offense. We are experienced in successfully defending such cases in federal court, which can have their own unique applicable laws and regulations. Our firm has handled very large and complex health fraud cases and investigations. This has become a high priority area, particularly for federal prosecutorial authorities. You need an attorney that is very experienced in white collar matters and federal matters, and is familiar with health care rules and regulations. Mr. Robertson's background and experience make this firm particularly well suited to successfully defend this type of case. Successful defense of real estate mortgage fraud cases requires a special type of experience and expertise, which can be provided for you by our firm. We have successfully handled real estate and mortgage fraud cases in the past, and have been involved as well in real estate. Criminal tax and tax fraud cases require experience, not only in basic white collar criminal defense, but also with the tax laws, procedures and in particular, a familiarity and background in federal law and procedure. 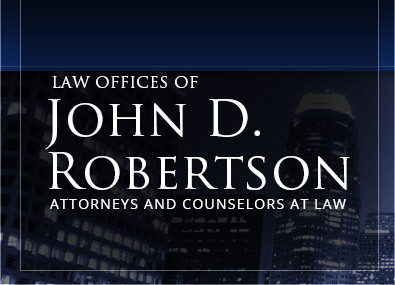 As a former federal prosecutor and as a federal criminal defense attorney for many, many years, Mr. Robertson has the experience, knowledge, resources, and skill to successfully defend you in such as case. Wire fraud cases are, for the most part, handled in federal court, and require and experienced federal practitioner, as well as someone who is familiar with fraud cases. For example, in federal court, the potential sentence, if convicted, of a fraud case, requires a calculation of "loss" and an application of the federal guidelines. Many lawyers, who practice in state court, are not familiar with such calculation and laws pertaining thereto and, more importantly each the depth and breadth of experience in dealing with such a calculation and handling these cases on a regular basis. As an experienced federal practitioner, Mr. Robertson can adequately represent you in fraud cases, as well as significantly reduce the consequences if you are convicted, of a criminal offense involving fraud. Almost always federal in nature, such cases requiring familiarity and experience with defenses under both applicable tax codes and general criminal law. Mr. Robertson has such experience and can successfully defend such cases. As one example, Mr. Robertson won acquittal on tax fraud charges for one client after a month long jury trial, which involving allegations of substantial and significant tax losses from a well-publicized tax avoidance and tax protest scheme. These cases have special applicable rules and procedure, including issues regarding the admissibility of evidence. You need a law firm that has actually handled organized crime cases. Over many years, our firm has handled organized crime cases, and in fact has done so in federal court in cases involving trials lasting up to months in duration. The federal racketeering statute, has specific legal requirements and specific laws applicable thereto. Our firm has experience in handling many racketeering prosecutions. You need a law firm and a lawyer that is familiar with the racketeering rules and laws in order to successfully defend such cases. Generally, criminal conspiracies can be alleged involving wide ranges of underlying criminal conduct. Not only do you need a lawyer familiar with conspiracy law and procedure, but you need a lawyer familiar with substantive criminal law. Criminal conspiracy cases have been called the favorite of prosecutors, because they have special rules regarding the admissibility of evidence against defendants. We will fight for you to neutralize such evidence, and have been successful in defending many criminal conspiracy cases. Narcotics and Drug Possession cases have their own special requirements and laws. For example, in federal court, there are mandatory minimum sentences for convictions involving possession of certain specified amounts of narcotics. These cases are extremely important and should be vigorously defended. We have vigorously defended many people against the narcotics laws, and have won cases and beat mandatory minimum sentences for our clients. You need a law firm that is familiar with constitutional challenges to these cases, and the search and seizure laws. We have handled both and have been doing so for many, many years. Federal in nature, criminal immigration defenses require someone who is familiar with the federal laws and procedures, as well as specific criminal immigration investigations and the criminal enforcement of immigration laws. This differs substantially from civil immigration matters. Our law firm, without question, has many years of experience in successfully defending people charged with criminal immigration offenses. We will vigorously handle your matter and can make the difference for you in court. Customs and Smuggling Offenses are unique area of the law involving federal criminal penalties and potential jail time for customs offenses and for smuggling in goods internationally. Our law firm has experience in customs and smuggling offenses over many years and has in fact defended cases involving international smuggling offenses and allegations. These cases can be criminal in nature, and often require coordination between a civil and criminal proceeding. Criminal copyright and trademark infringement is almost always federal in nature, thus requiring a background in federal law and procedure. We have handled criminal copyright/trademark infringement cases, and these cases often turn upon the alleged damages or harm caused by the activity. We have been involved in copyright trademark infringement cases which were international in nature, and have been successful in handling these matters. Also, you need a law firm that is familiar with the potential civil consequences of a criminal copyright trademark infringement case and the effects that the criminal case can have on the civil case or vice versa. Our law firm is experienced in this area. As one example, we successfully resolved a case involvement allegations of international theft of trade secrets/copyright infringement by a computer engineer, accused of transferring protected date from a major Silicon Valley firm to a counterpart in another country, without jail time and with no civil liability against our client. Requires not only a background and experience in these type of cases which we have, but also as a relatively new and fast changing area of the law given the technological advances. We keep abreast of the latest law involving computer crimes and software counterfeiting. Once again, most of these law is federal in nature. We have handled numerous firearm offense cases, including those cases involving firearms which can possibly carry a potential consecutive mandatory minimum sentence to any other conviction. It is important that these cases be vigorously defended and fought because of the high consequences of being convicted of a firearm offense. There are also what we call collateral consequences, involving possible loss of the right to possess a firearm and the future upon a conviction. We have handled all kinds of theft offenses, including thefts of property, theft of intangible property, grand theft, etc. Theft cases are unique in that for example, often times the potential resolution and possible jail time is determined by a calculation of a value of the items allegedly stolen. So not only must you have a lawyer that can vigorously defendant against a simple theft case, but you must have a law firm that is experienced in the calculation of alleged loss for theft purposes. We have been successful in this area and have routinely been involved in the calculation of loss issues, primarily in federal court. Prosecutions for violating money laundering and bank structuring laws are becoming more common. In these cases, the government tries to obtain criminal convictions for engaging in financial transactions with money obtained from felonious or illegal activity, or for trying to structure bank deposits to avoid reporting of income. These prosecutions are invariably federal in nature, requiring a firm with expertise in federal law and procedure, criminal law experience and knowledge of money laundering laws and regulations. We have that expertise, knowledge and experience to successfully represent you in these matters.